America's Best CPA Review Since 1971. 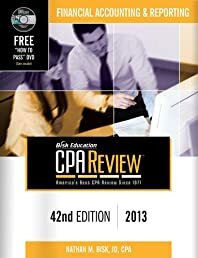 These comprehensive textbooks are the perfect tool to study for the Uniform Certified Public Accountant (CPA) Exam and are the resources you will refer to over and over again for exam tips, techniques, strategies and, of course, answers. Our 4-volume textbook series provides comprehensive coverage of all exam topics and includes a free simulations CD-ROM to practice simulation questions in a format that will help prepare you for the actual exam. Available separately or in a 4-volume set, our textbooks will enable you to achieve maximum preparedness to sit for the CPA exam. - Tips, techniques and strategies on how to prepare for the CPA Exam, including a Getting Started section that provides a recommended weekly training plan. Bisk CPA Review is the only CPA review texts developed by full-time experts. Publisher and Editor-in-Chief NATHAN M. BISK, JD, CPA (FL) is both an attorney and a CPA in the State of Florida. His background includes public accounting experience at both Ernst & Young and Arthur Andersen & Co. Mr. Bisk has written and taught CPA Review, accounting, auditing, taxation, and business law programs since 1970. Contributing Editor ROBERT L. MONETTE, JD, CPA (PA) is a specialist in continuing professional education and nationally recognized as an expert on the CPA exam. His background includes experience in statistical sampling, EDP auditing, financial statement analysis and taxation. Mr. Monette has also taught CPA Review in Boston, New York, and New Jersey, where he has helped tens of thousands of candidates become CPAs. Contributing Editor PAUL MUNTER, PhD, CPA (CO), is a Partner in the New York office of KPMG, LLP. He has extensively published articles on financial accounting and auditing matters in journals such as the Journal of Accountancy, CPA Journal, Management Accounting, Accounting Review, Today's CPA, and Practical Accountant. Dr. Munter also teaches CPE courses for accountants in public accounting and industry. Consulting Editor DONALD C. ALEXANDER, LL.B., LL.D., is a Partner with the law firm of Akin, Gump, Strauss, Hauer and Feld. He has served as Commissioner of the Internal Revenue Service, is the former Director of the United States Chamber of Commerce, and is the former Chair of the Commissioner s Exempt Organizations Advisory Group, and is a nationally recognized author of more than 30 articles on federal tax subjects. MORTIMER M. CAPLIN, LL.B., J.S.D., LL.D. RICHARD M. FELDHEIM, M.B.A., J.D., LL.M., C.P.A. C. WILLIAM THOMAS, M.B.A., Ph.D., C.P.A.